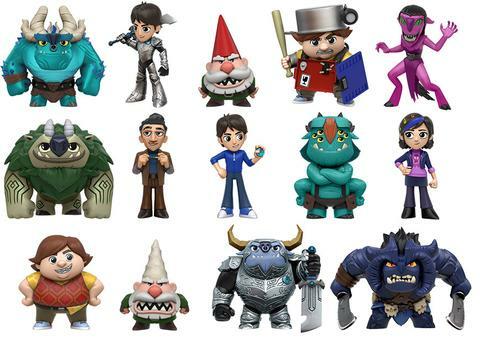 2017 Funko Trollhunters Mystery Minis offers a delightful array of subjects from the acclaimed animated series on Netflix. Presented in the well-established blind-box format, Jim and his best friends—Claire and Toby—are among the choices. While this is the first series, many of the Funko Trollhunters Mystery Minis figures mimic their larger Pop! Trollhunters editions, with the exception being different poses. Familiar faces include Jim wearing armor, Toby in a red sweater, or in armor, and Claire rocking her signature purple attire. Although Aaarrrgghh!!! and Blinky are practically miniature Pop! replicas, Bular appears more frightening as he stands with a sword in each hand and flashes a menacing expression. Additionally, changelings include Nomura in her fuchsia Troll form, and Stricklander as human Walt Strickler. 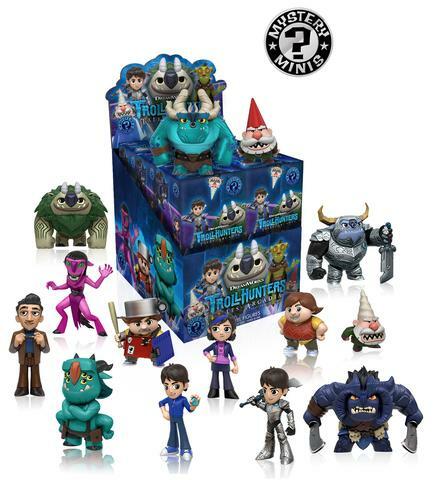 Although the packaging is intended to keep the element of surprise, the Funko Trollhunters Mystery Minis set contains a few figures that could hamper this due to their size. This is especially true since both Draal and Kanjigar the Courageous appear slightly larger (heavier?) than most of the options. Of course, that does not guarantee any particular figure. Collectors should also take into account that there are at least 16 figures to hunt, barring any unannounced exclusives, and each case holds just a dozen boxes. Therefore, you will need a minimum of two cases in order to complete the set and even that might not be enough for figures that have extreme rarity. Individual figure box odds are noted below. Saw a box opening with 2 Kanjigar and a Blinky. Wife and I bought a box with exact same distribution. Kanjigar are all over eBay – looking like Funko printed their odds wrong.